When a baby comes along, they say that everything changes. Oh boy, are they right. Gone are the days when you could pack for yourself at the last minute, hop on a plane, crack open a book, have a drink and zone out for several hours. Now, packing for everyone in the family (and surviving the flight) is something of an Olympic sport. Your goal is to not only land with your baby and you safely in one piece, but also to keep your little one as happy and content as possible while strapped into a small seat. You have to be prepared with enough supplies to get you through potential delays, diaper blowouts, spit-up, boredom and more — but without packing the entire nursery and turning yourself into a parental pack mule. Sound challenging? It certainly can be at first, but like with anything in parenthood, you will quickly become an expert at flying with your child. As a mom of two who has been on well over a hundred flights with her kids, I’ve created this survival guide to help get you on your way. Step one in surviving your child’s first flight is making sure you have all the right paperwork in hand before you ever leave for the airport. If your travels will take you to an international destination, you must have a passport for your child. There is no real way to get a jumpstart on this process before a baby is born (you’ll need a passport photo of your newborn, after all), but you can apply as soon as you have a copy of his or her certified birth certificate. You will want to request that as soon as possible after your baby’s birth if an international trip is on your calendar in the first few months. If you’re traveling domestically, your kids don’t need a passport, but you may need a copy of your child’s birth certificate. Children don’t need an ID for TSA security purposes until they are 18, but I recommend having a birth certificate on hand, especially if you are flying with your baby as a lap infant. Southwest Airlines, in particular, is known for requiring birth certificates to prove that lap infants are under two years of age, even when the child is clearly still an infant. Since most airlines have a requirement that a baby is at least a certain number of days old before flying, you can bring birth documents from the hospital to prove your baby is indeed above that minimum age threshold (often seven days old) if you are flying with a true newborn. On a travel day, I recommend keeping as normal of a schedule for your baby or young child as possible. You can do this by keeping wake-up times, meal times, nap times and play times as consistent as possible. Booking a super early morning flight is a surefire way to quickly disrupt your child’s delicate schedule. Some travelers like to delay nap time, or book a flight at night so the kiddos will hopefully sleep on the plane. That will work for some children, but it poses a real risk of having an awake but overtired baby on the flight. This may not apply to young babies who still sleep the majority of the day, but once your baby outgrows those first few sleepy months and has a set schedule, take that into account when selecting a flight. That said, babies develop quickly, so if you are booking a flight several months in advance, their schedule may be dramatically different when the travel date arrives — so make your best guess and then go with the flow. Babies can sit in your lap for free on domestic flights in the US until their second birthday. On international flights, there is frequently a fee of 10% of the going fare for lap infants, though that amount varies by airline and by whether or not you are flying using miles or are on a purchased ticket. That 10% fee sounds small, but it can be hundreds or even thousands of dollars if you are flying on an international first or business class ticket. Most airlines are pretty good about allowing you to use an adjacent open seat for your lap child if it is available, but the likelihood of finding an adjacent empty seat during peak travel dates is pretty slim. The bottom line is that if you don’t purchase a seat for your young child, don’t expect one to be available for you to use on the plane. If you have the means to secure a seat, especially for kids over 12 months, it will likely make your travels much more comfortable. Not only will your child have his or her own space, but you will also have additional space under your toddler’s seat for all of your carry-on items. While air travel is very safe compared with travel by car, the absolute safest place for your baby on the plane is secured in their car seat. 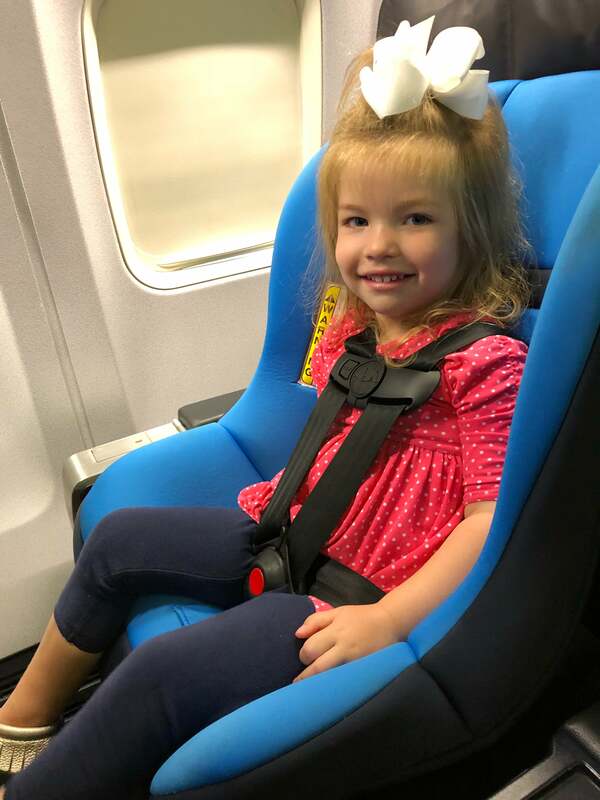 If you have purchased a seat for your child, you will have to decide whether to bring a car seat; to use a different FAA-approved restraint; or to simply rely on the regular airline seat belt. In addition to the safety considerations, some young children and babies will simply sleep better and generally be more comfortable in a car seat than without one. You can make an educated guess about how your child will do in their car seat on a plane based on how they do in your car. Personally speaking, we had great success using car seats onboard for our children when they were between the ages of about one to three years old. I highly recommend having a lightweight and inexpensive car seat that you use just for travel. We use the Cosco Scenera that retails for under $50 and only weighs about 10 pounds. You can also purchase a device that allows you to push your car seat through the airport like a stroller from around $50. Alternatively, you could spend a lot less to purchase a strap that will attach the car seat to your roller bag. Once your child is a toddler, the FAA-approved CARES Harness , made for children between 22 and 44 pounds, is much easier to pack than a car seat, as it will easily fit in a purse or backpack. My own personal experience when using the CARES Harness for toddlers is that it doesn’t encourage onboard sleeping as much as a car seat, but for shorter flights, the streamlined product may make the trade-off worth it. Another thing to consider when deciding whether or not to pack a car seat is if it will even fit in your assigned seat. Some airline seats are so narrow — and close to the seat in front of them — it is entirely possible the car seat won’t fit in at least some of the rows. Spirit Airlines even warns on their website that a car seat will not fit in certain seats. You can use seatguru.com and your airline’s website to check the size of the seats on your aircraft. For reference, the Cosco Scenera car seat is about 18 inches wide, so if your airline seat is slimmer than that, it won’t fit. When you use a car seat for toddlers, there is also a very high likelihood that they will be able to easily reach (read: kick) the seat in front, so be prepared and do your best to prevent them from disrupting that passenger. If you plan to travel often with your baby, a gear investment to consider is a Doona. The Doona is about $500, but it quickly converts from a car seat to a stroller. This allows you to push your baby through the airport and then, with a few clicks, install their car seat on the plane without even removing your child. This also works great when getting in and out of cabs and cars on your adventures. I may have cried a few tears when my second daughter outgrew her Doona — though, admittedly, those tears dried fast when we resold it for two-thirds what we originally paid. Every airline has their own carry-on luggage policies for all passengers, and then some policies that relate specifically to babies and their gear, including car seats and strollers. While you should review your airline’s specific baggage policy, you will find that most airlines are relatively generous with baggage allowances for young travelers. Even the notoriously stingy Spirit Airlines allows one stroller and one car seat to be checked for free, as well as permitting one diaper bag per infant. I prefer to gate check our stroller so we can use it to get through the airport. If your stroller is small enough, you may even be able to bring it onboard and put in the overhead bin. 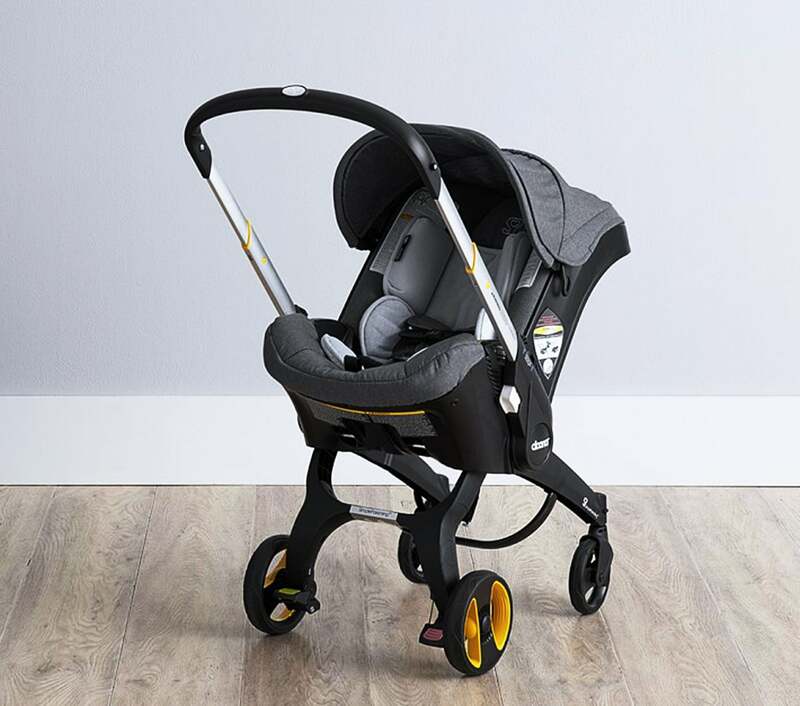 For example, the Pockit Stroller collapses down to 11.8 inches by 7 inches by 13.8 inches with a weight of under 10 pounds. If you plan to tote your baby through the airport in a sling or worn in a carrier, it may be easier to check your stroller and other similar items at check-in. Keep in mind that airlines typically state they are not responsible for damage to strollers and car seats, so it can make sense to have an inexpensive version you use exclusively for travel. Diapers and wipes (consider the number you’ll need for the flight). Two back-up, easy-to-wear outfits for young kids. An extra top for parents, at a minimum (trust me — you want this). An empty plastic grocery bag. Whatever you need to feed your baby or kids. This may include bottles, formula, pumped milk, a breast pump, a nursing cover, juice or snacks. Easy to eat snacks for you, especially if nursing. A refillable bottle of water. If you typically only fly solo, it may come as a bit of a surprise that it’s actually pretty difficult to get seats together for your entire family — without paying extra. With low cost carriers, such as Spirit or Frontier, or basic economy tickets on carriers like Delta, United and American, you will not be entitled to complimentary advance seat assignments. I recommend spending the extra money to secure seats together simply to avoid extra day-of-travel stress. If, however, you do not have it in your budget — or your children are older and sitting next to them is a perk, rather than imperative — be sure to book your party on the same reservation and check-in for your flight exactly 24 hours before your flight. This way the airline’s computer system is more likely to assign your seats together before availability becomes increasingly limited. In the event that you absolutely cannot get seats assigned together, get to the gate as early as you can to explain the situation to the gate agent. Be prepared to politely work with other passengers onboard to trade seats as a last resort, but keep in mind they are doing you a favor if they move. When selecting seats with young children, be aware that you need to avoid the exit rows, as well as the rows in front of and behind the exit rows if you are using a car seat. Car seats can, unfortunately, be really limiting in terms of seat selection. They cannot be used in rows where there are air bags built into the seat belts (this applies to some bulkhead rows and certain premium seats). And car seats, generally, must be placed on the window seat so they do not slow down an emergency evacuation. On regional and smaller aircraft, some rows may not have an extra oxygen mask for a lap infant, so check with the airline to be sure you have selected a row that will support a lap baby on a smaller aircraft. You won’t usually have that problem on mainline aircraft, but keep in mind that two lap infants cannot be in the same row of seats, as there is only one extra oxygen mask per row. This is personal preference, but I’m not a fan of selecting bulkhead seats when traveling with young children if there is no storage in front of you. Without that under seat storage, your diaper bags and other items have to go in the baggage compartments above the seats and will not be easily accessible. If you are flying on a longer flight that has bassinets available for young babies, call the airline to request those seats as soon as you book your tickets. This will often require you to sit in the bulkhead rows as the bassinets typically attach to the wall. Admittedly, bassinet policies vary significantly from airline to airline, but to give you some idea of what is available, British Airways has child seats and child cots available for children up to two years of age, while United Airlines has bassinets available for babies up to 22 pounds on some long haul configured aircraft. Before your first few flights with a baby, this is the time to get dropped off at the airport by a family member, friend or car service — as opposed to parking and lugging all your stuff to the terminal. You can use the curbside check-in for your luggage (bring a few dollars for a tip), and then you only have to enter the airport with what you plan to bring onboard your flight. At times, there is a shorter security screening line for families with small children, but don’t count on that since it is not available at all airport locations. Additionally, if you qualify for TSA PreCheck, that can really cut down on time spent waiting in security lines. Children 12 and under can keep their shoes on and go through PreCheck with you without their own PreCheck approval if you have PreCheck. 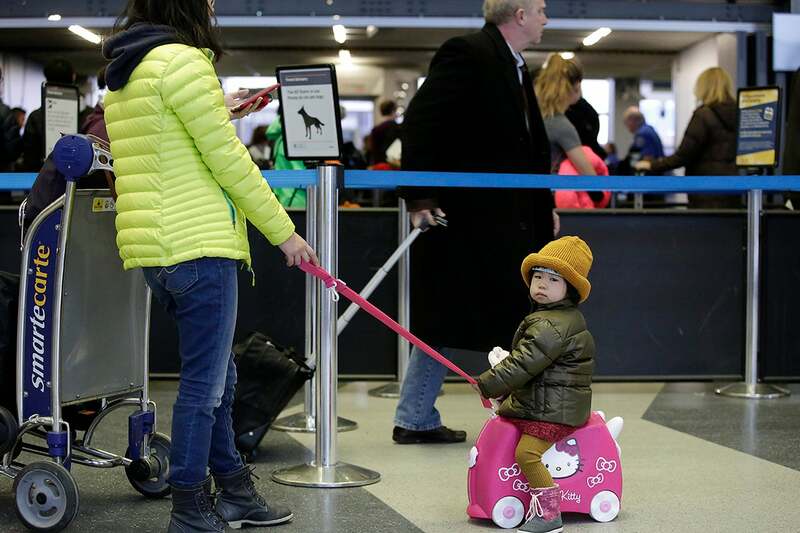 But if you don’t qualify for PreCheck, every member of the family 13 years of age and up will need to remove his or her coat and shoes, while liquids and even certain snacks and electronics may have to be removed from your carry-on bags. You will also be required to collapse your stroller and send it through the security screening device. If you are wearing your baby, you should not be required to remove the child to go through security. Some airports and TSA agents are very liberal about the quantity of liquids you can bring through for infants and toddlers, and some are very stringent. The TSA rules are that you can have a reasonable quantity for your babies and toddler. You may pass through security with everything you need without incident, or you may be required to have a full bag search and pat-down if you are bringing through liquid in quantities greater than 3.4 ounces. I recommend packing in a way that all of your snacks and liquids are easy to find and quickly remove for inspection. If you are traveling with breast milk, you can do so with or without your baby with you. You are permitted to utilize ice and totally frozen ice packs, and you can even fly with up to 5.5 pounds of dry ice per the FAA. However, check with your airline regarding their dry ice rules if you plan to go that route. 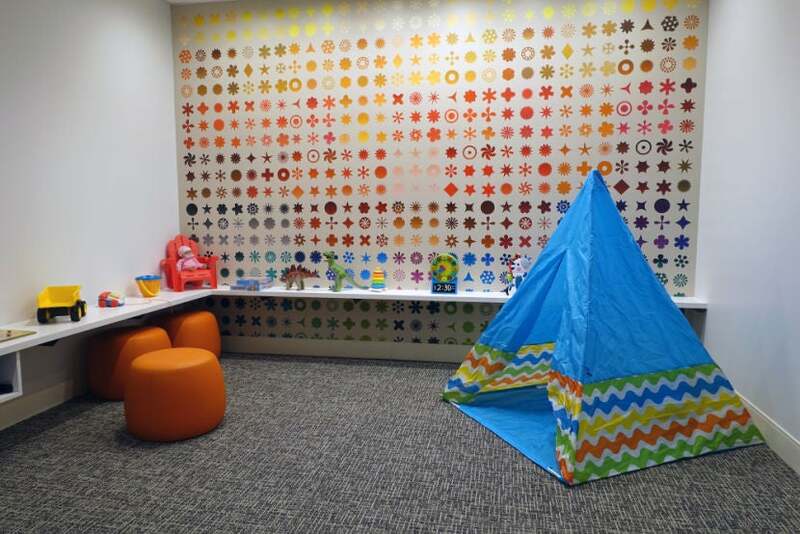 The kid’s room in the IAH Centurion Lounge. Once you are through security, I recommend either going to an airline lounge that has a family room (some of the Amex Centurion Lounges accessible with The Platinum Card® from American Express have these), utilizing the airport’s play area or finding a corner of a boarding area to keep your group together. If possible, keep toddlers and young children active in the airport so they can burn off steam before sitting still on the plane. Unless your group is starving, I actually don’t recommend eating in the airport. After all, eating on the plane can be a great way to kill some time. However, you may need to purchase food in the airport to eat onboard if you didn’t pack snacks from home. If your baby is nursing or drinking bottles, be sure to have milk available during take-off so they can use the sucking movement to help alleviate pressure in their ears. 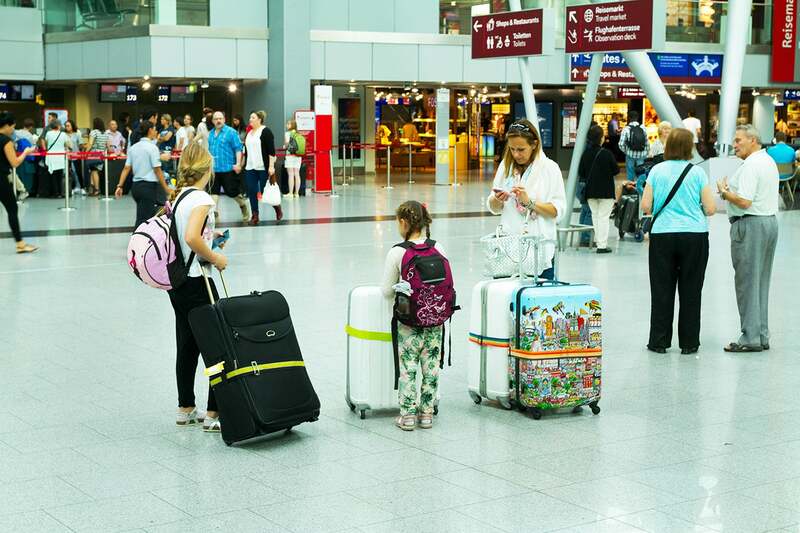 Not all airlines board young families onto the plane first, but many still offer it either on a case-by-case basis, or at some point later during the boarding process. My advice is to get at least one parent onboard as early as possible to set-up the car seat or CARES Harness and secure space for necessary items in the overhead bins. Some families prefer to keep the actual children off the plane until the last minute, and that is a solid strategy if you have seat assignments — and if you aren’t waiting until the last minute to find space for bags and install car seats. 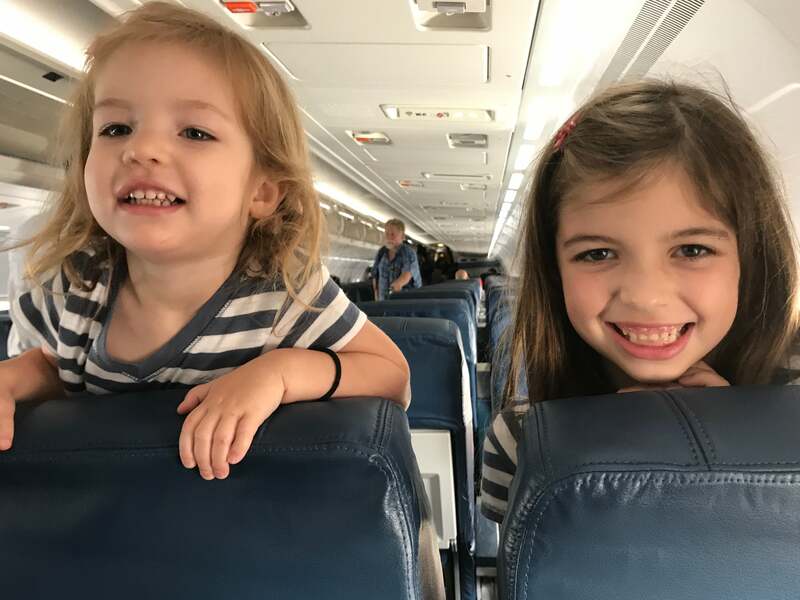 Unless you are unlucky, parents who prepare adequately for the flight should find that sitting in the airplane seat is one of the easier parts of the trip. I know people facing their first flight with a child worry most about all those hours spent at cruising altitude, but once you are settled down with activities and snacks at your disposal, it shouldn’t be too terrible. Fingers crossed. The exception is if your child is very tired and cranky, or has trouble with their ears during take-off or landing. This can all quickly lead to tears. When our daughters were young, we made sure they were drinking or nursing on both take-off and landing to help avoid any potential ear issues. When they were preschool age, we supplied suckers. Gum works once you trust your kids won’t leave it on the seat for the next passenger. Also, don’t use large electronic devices for entertainment during the boarding process, since you will have to turn them off for take-off (and keep them off until you are at 10,000 feet). However, it’s fine to use iPads and tablets the entire time, so you can get those going as soon as your kids are in their seats if you wish. For at least your first few flights with a little one, I recommend planning activities for your children that last for the duration of the flights — plus a little extra time. For infants, the activities you plan may be limited to nursing, bouncing, walking up and down the aisle, sleeping, singing and rocking. My favorite toddler travel trick is to have some new toys that he or she has never seen before available, which may hold their interest longer. Special treats like M&Ms or suckers can also be a last line of defense in delaying an all-out meltdown. Try visiting garage sales and resale shops to stock up on “new to you” toys for less. Saving small toys from Happy Meals can also provide for some (cheap) onboard entertainment. The cardinal rule of onboard activities for kids is to never move on to the next activity until your child is unhappy or has totally lost interest in the present activity. 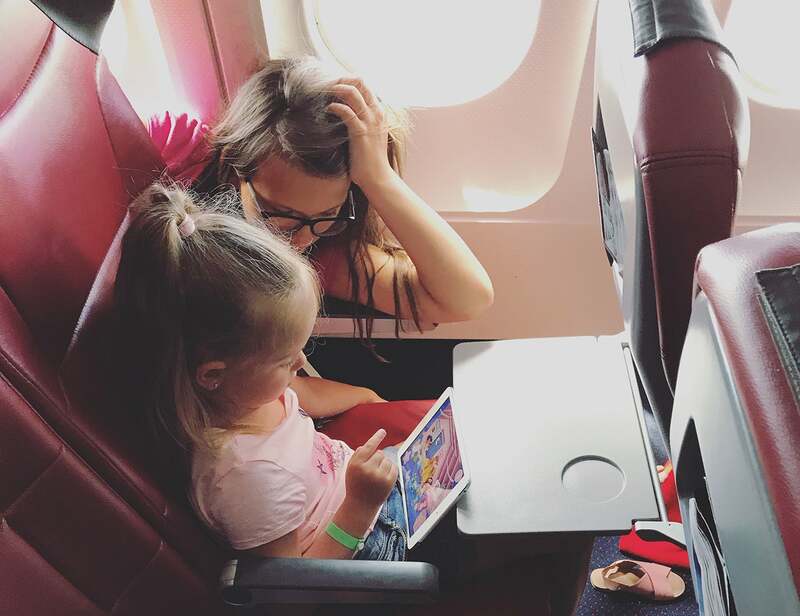 For toddlers, it can also helpful to prepare them by talking about the flight and reading travel books in the days or weeks leading up to the trip. If you make it sound exciting, it will be. If you are traveling with another adult, take turns being the lead parent for your baby. Switching off roles not only ensures you both get a break for a few minutes, but it may also be a solid change of pace for your baby, too. That said, I recommend waiting until later in the flight, unless it is absolutely necessary to get up, because once you let your toddler know it’s OK to walk around, it can be hard to turn off that option. And when it comes time to change a diaper, do that in the lavatory — not at your seat. Also, if you are flying with a potty training or newly potty trained child, put pull-ups on them before the flight even if you are beyond that stage at home. On a plane, unfortunately, you can’t always get to the bathroom at a moment’s notice. 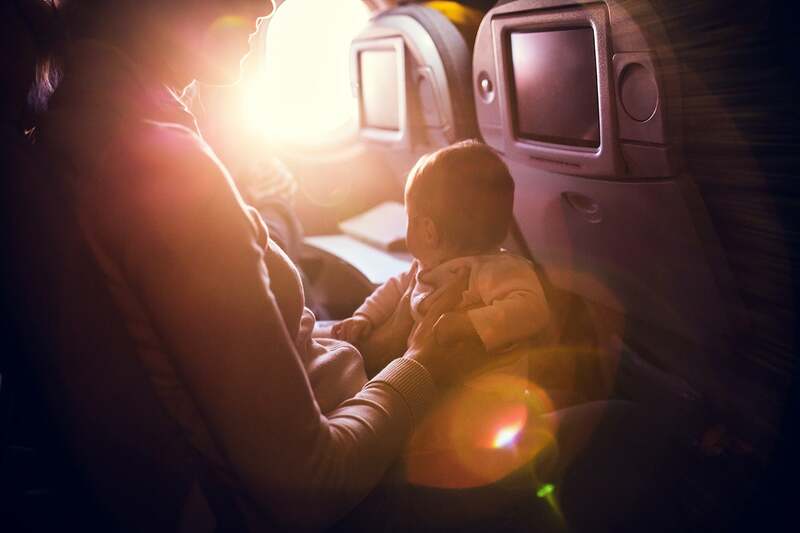 Hopefully, your baby’s first flight will be smooth sailing. Not every family, unfortunately, draws the winning hand on every single flight. You may have a diaper explosion, a complete crying episode or an upset tummy to contend with. The most important thing to remember is to stay calm and focused. You may be stinky, messy and exhausted by the time the plane lands, but eventually the flight will be over and whatever onboard meltdowns you experienced will end. Getting worked up will only make the situation worse, so try to stay in a Zen-like mode as much as possible. Work to solve your baby’s obvious issues as best you can, and keep trying different things to diffuse the situation. Hold them, bounce them, feed them, burp them, change them — do all the things you do on the ground, just in a smaller space. Most of the time, other (reasonable) passengers only get irritated with upset children when the parents don’t seem to be making an effort to calm them down. Just don’t worry too much about other passengers in the middle of a crying baby crisis. Instead, keep the focus on your baby and eventually he or she will settle back down. Or the flight will end. Unless there is a reason for your family to get off the plane ASAP, it is often best to let the other passengers deplane while you wait to depart the aircraft with all of your gear once the aisles have cleared. If you are lucky enough to have someone picking you up at your final destination, then give yourself a high-five because the toughest part of your journey is likely over. If you are renting a car, hold off on having a “we made it” celebration for a bit longer. After eight years of family travel, I can honestly say the toughest part of the trip can be getting the whole family and all of the luggage onto the shuttle bus and installing car seats in the rental car. It’s simply a lot to manage when you are already exhausted and ready to stop moving. If you have to pick-up a rental car at your destination, consider having one parent stay with the children and luggage at the airport (if it’s an option) while the other parent takes the car seats and goes to retrieve the rental car. Travelers can also see if Silvercar serves their destination airport, as they will pick-up and drop-off customers directly at the airport terminal in certain locations. They also have complimentary Peg Perego car seats available with all of their rentals. Those with kids know that no amount of preparation can guarantee a smooth flight. But despite how interminable it can feel in the moment, the flight will not last forever. The airplane will land and you will probably never see anyone from that flight again. While there are some grumpy folks out there, most travelers are very sympathetic and understanding of the trials and tribulations of flying with a young child. There may very well be a point during the trip when you feel like it was a mistake to ever leave the house with your baby or young child (or even your teenager). That is a totally normal part of the process, but at the end of the trip, you will almost certainly be glad that you did. At least after a little rest.